Fish oil is a natural solution to revitalize aging skin, promote more vibrant and youthful skin, prevent eczema and psoriasis. Fish is leaner than meat, that is lower fat, and contains amino acids and minerals that are vital to the body. 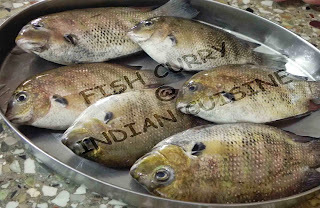 There is anywhere from 15gm to 30gm of protein in fish depending on the type of fish and how it is cooked. 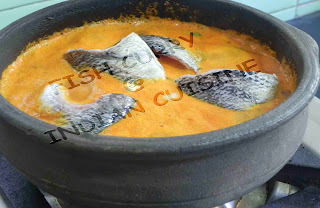 In Konkani Fish curry, the curry is incomplete without coconut. 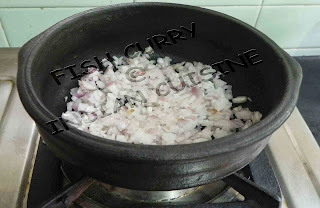 As explained in teppala ambat recipe, there are few fishes which go well with onion. 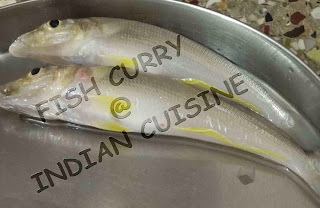 They are Lady Fish (Nogli in Konkani or Kane in Kannada), Silver Fish( Belanji in Konkani), Shethka and Shawnte jabba(in Konkani, these two are found at the coastal belt, no idea what are they called in English), Shark( Mhori in Konkani) and shellfishes like Prawns( Sungat in Konkani), Crab ( Kurlo in Konkani). This curry has to be little less spicier than the one with teppal. 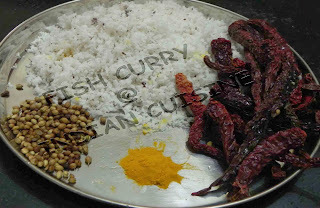 Here I have used Kagalshi(in Konkani, no idea what it is called in English) and Lady Fish. 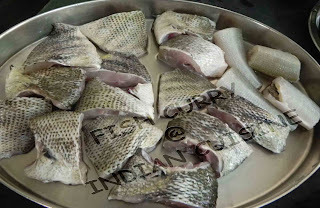 Wash fish, cut into small pieces as shown in figure. Clean the pieces thoroughly and apply salt and keep aside. In a small pan heat ½ table spoon oil fry coriander seeds and red chillies and let it cool for a minute. 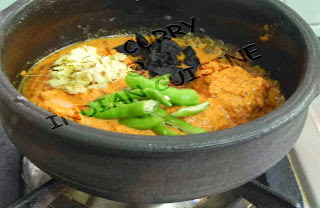 Grind coriander seeds, red chillies, grated coconut, turmeric powder and make a fine paste.. 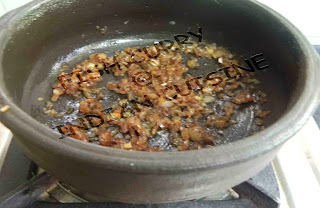 In a pan heat ½ table spoon oil add finely chopped onions fry till golden brown, add the ground paste and fry until raw smell flies off in the air. Once done add water, make it into a semi thick gravy and get a bubble boil. Add finely chopped ginger, finely chopped green chillies , dried kokum and salt to taste Then add fish and simmer for 4-5 minutes. Close it with a lid and switch off. 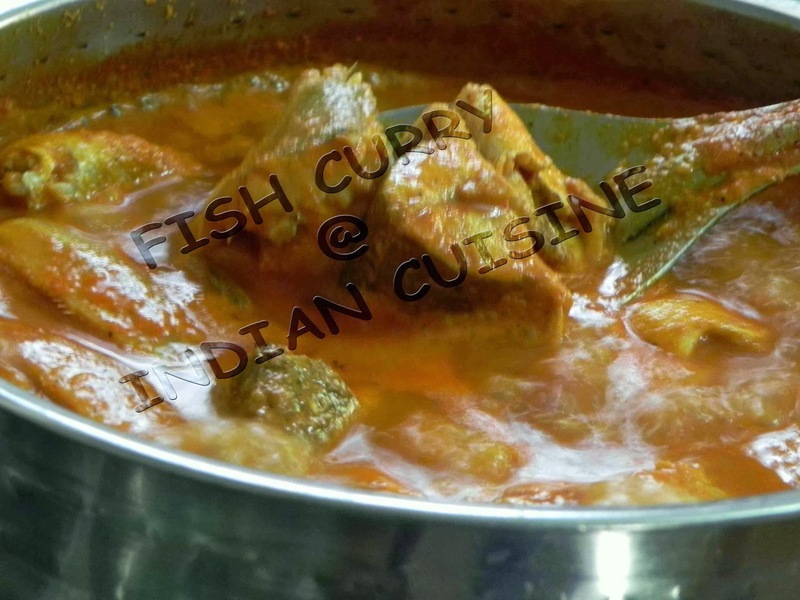 Serve hot fish curry with white rice. PS: Do not stir the curry with a spoon as the fish pieces will break. Just give the vessel a twist. The taste of gravy increases once the fish absorbs the gravy. So preferably serve it after 2-3 hours. Yes, we can use tamarind. Liked your delicious dill leaves curry with dal. The pot in this post looks traditional.